Rediscover relaxation in a spacious and elegantly appointed Jr. Suite with stunning garden views. Your suite has a large bedroom with two double beds and a comfortable seating area, dressing area, full bathroom and a kitchenette. 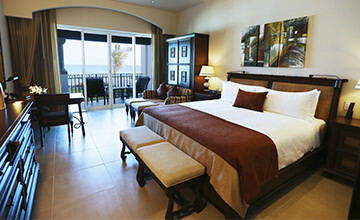 Amenities include flat screen TV, DVD player and Wi-Fi. 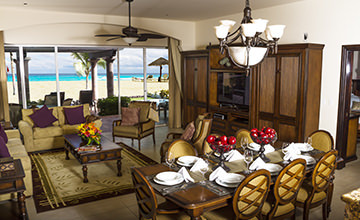 For a magical Riviera Maya vacation, stay in a luxury ocean-view Jr. Suite at Grand Residences. Your beautifully appointed suite has a bedroom with a king-size bed and a comfortable seating area, dressing area, full bathroom and a kitchenette. 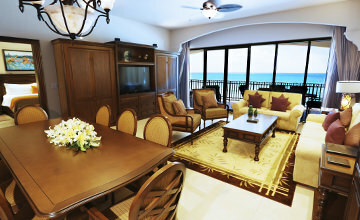 Amenities include flat screen TV, DVD player and Wi-Fi.